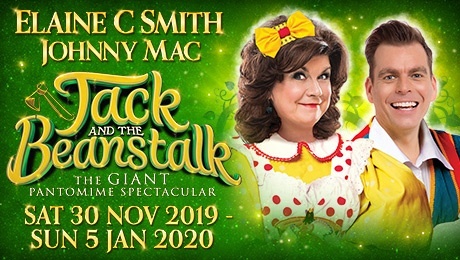 The Glasgow King’s Theatre 2019 Christmas panto will be the magical pantomime adventure Jack and The Beanstalk. Starring Elaine C Smith alongside Johnny Mac. Packed with all of the traditional panto ingredients King’s Theatre audiences expect, Jack and the Beanstalk will feature laugh-out-loud comedy, stunning scenery, beautiful costumes and plenty of boos and hisses. See it from 30th November 2019 to 5th January 2020. If you’ve never seen a Panto at The Kings Theatre in Glasgow, then you’ve missed out! In 2018 it was Aladdin starring Elaine C Smith as Widow Twankey alongside Johnny Mac as the lovable eejit Wishee Washee. We followed Aladdin, his brother Wishee Washee, and of course his mother Widow Twankey, on a spectacular adventure. There was flying carpets, a wish-granting genie, an evil sorcerer and a lamp-full of laughs. Paul-James Corrigan, from Gary Tank Commander also stars as the Imperial Palace Guard in the magical pantomime adventure Aladdin. In 2017 it was Sleeping Beauty: A panto favourite: Once upon a time in a land far far away, the beautiful Princess Aurora is given a 16th birthday present by her evil godmother Carabosse. Sleeping Beauty is placed under a cruel curse and forced to sleep for 100 years after she pricks her finger on an enchanted spinning wheel. In 2016 it was Snow White and the Seven Dwarfs: For only the second time the Kings are delighted to present the fairest pantomime of them all Snow White and the Seven Dwarfs. Scottish comedy legend Gregor Fisher lead the cast of panto favourites, the Rab C. Nesbitt star adds another string to his vest in the role of Hector the Henchman alongside much-loved panto favourite and Capital FM presenter Des Clarke as Muddles and Juliet Cadzow (Balamory, Panto Pie and a Pint) as the Wicked Queen. In 2015 it was Peter Pan: Widely hailed as one of the best for many years. 12 gallons of water, 11 lions rampant, 10 tartan teddies, 9………. 8 sausage suppers, 7 ……. Brilliant! Even my 1.5 yr old grandaughter was dancing at the end. The 4 and 5 yr olds thought it was fantastic. Lots in it for the whole family. Everyone in it was excellent but Karen Dunbar and Gerard Kelly were outstanding. Took the family to see this on Wed night, tremendous setup and hilarious script. Well done Guys….Can anyone help me here though as the kids and I can’t remember what 11 was in the 12 days of xmas song!!!! 10 was tartan teddies and 12 was gallons of water.. I would recommend it for all ages! I can’t wait too see it !!! i am going with my school i went to see cinderella last year and it was fan daby dozey !!!!! can’t wait ti gi see aladdin 😀 !!!!!!!!!! An absolute hoot! Lots of fun for all the family with great songs and amazing costumes – karen Dunbar is a fantastic Dame!